Anyone play MMORPGs? New Final Fantasy 14 has released as a form of MMO. Also streaming when I'm having pizza or other types of food. 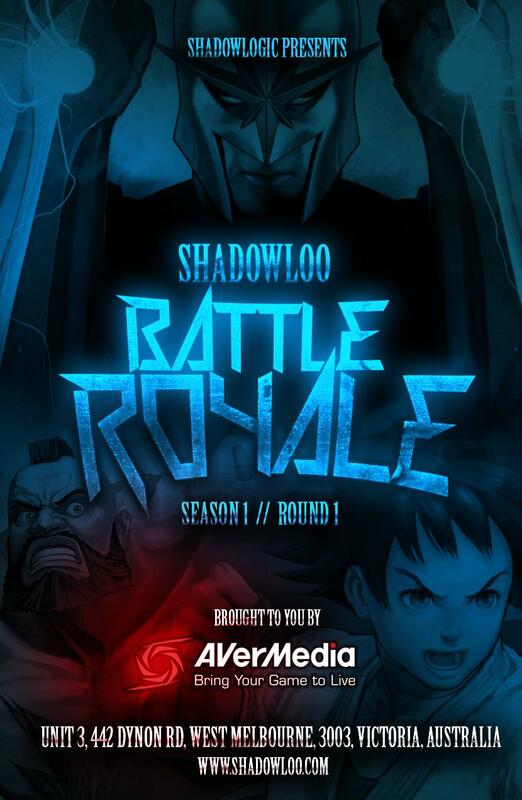 Hey guys, it's time to launch our first official seasoned event at ShadowLogic HQ and what better way to start than with "Shadowloo Battle Royale"
SBR is a fighting game event for competitors, casual players and spectators a like. Below is all the info you need to know, but if we miss something or you have any questions, please leave them below. ShadowLogic HQ - Unit 3, 442 Dynon Rd, West Melbourne, 3003, Vic, Australia. Tournament Entry: $5 for each tournament which goes towards the pot prize. 1st Place: 70% of the tournament entry pot. 2nd Place: 30% of the tournament entry pot. NOTE! Season winners for AE2013 and UMvC3 will win a trip to Singapore and seeding points to the "South East Asia" major fighting game event in June 2013. Made possible thanks to AVerMedia and SGFighter! Placing in the top 8 for each round of any official tournament will earn you ranking points. The top 8 ranked players after 3 events (Season) will play off in a top 8 double elimination bracket. Below is the points you earn based on the placing you finish in. 12:00PM - Doors Open for casuals and registrations. 1:00PM - Street Fighter X Tekken Tournament. 1:30PM - King of Fighters XIII Tournament. 2:30PM - Super Street Fighter IV: AE2013 Tournament. 5:30PM - Ultimate Marvel vs Capcom 3 Tournament. All official tournaments will be run on the Xbox 360 console on top of the line BenQ gaming monitors. Best of 3 rounds, best of 3 games. Winner can't change characters or order. Loser can change characters and order. Grand Final: Best of 3 games. Best of 5 rounds, best of 5 games. Grand Final: Best of 5 games. Winner can't change character, but can change ultra. Loser can change character and ultra. Losers, Winners and Grand Final: Best of 5 games. Winner can't change characters, order or assists. Loser can change characters, order and assists. While SFxT, KoFXIII, AE2013 and UMvC3 are the official tournaments of Season 1, we will also have side tournaments for various other games through the season which include the following. DoA5, SCV, TTT2, 3rd Strike, Smash, Injustice and more. *Side tournaments are subject to change from round to round. Please bring your own controller or arcade stick. If you don't have any, we'll be happy to lend you ours for just $2. This is to help us keep all our gear maintained and in good working condition. Tournament Announcements / [Melb] Shadowlogic SF4AE:2012 2v2 Tournament. Copy and Pasting from the Facebook event invite description! Listen up fighters, grab yourself a partner and join us for some 2v2 Super Street Fighter IV: Arcade Edition action. If you don't have a partner, we'll find one for you on the day. NOTE -- There will be plenty of other set ups for those who just want to come down and play casuals against others in various fighting games. Please bring your own stick or controller. If you can't bring your own, we will have some sticks on hand for you to rent for the day for $2. PRIZES -- Winning team will win 70% of the prize pot. Runner up team will win 30% of the prize pot. FORMAT -- Tournament will be run on the Xbox 360. You and your partner will be (A) and (B). (A) will fight the (A) of the opposing team. (B) will fight the (B) of the opposing team. If both (A) and (B) on your team win their fight, your team wins and moves on. If either (A) or (B) on your team lose their fight, they must fight the remaining fighter on the opposing team. Each set will be best of 5 rounds, best of 1 game. Teams cannot feature the SAME character. Players cannot change characters until the next round. If you have any questions, please leave them in the comments section below! For all Melbourne Marvel players, come down for some training for Antman as he is heading to Japan tonight for this SBO debut. Open from 3PM till late. $5 entry will give you access to all games for all day. Please support international Soul Calibur players! Wonder if there are more surprises in store. Selling the limited edition Modern Warfare 3 Xbox360 controllers. $60 including Shipping. Cheaper than Ebay. got 2. Either I fail at searching or there was no SNL R7 thread.